My Rangefolder Cameras: No parts departed when in use anymore, thanks for Jack! No parts departed when in use anymore, thanks for Jack! this trip to H.K. the greatest gift I got is from Jack, another photography mania, who tried the camera, and provided many invaluable suggestions to improve the operation. 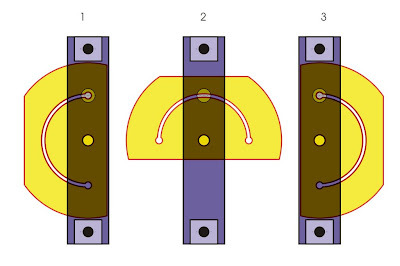 One of the best is to change the plate operation for double-sided film back. My original design is a metal plate, when in use of double-sided film back, put it on right side of the base; when in use of graflok style back, take the plate out, and insert it to the left side of the base. This plate is the only parts separated from camera body, who needs take-off / put-back action, though this reduce a lot of parts departed from body, compared with those spring back or screw things other back systems do, but still take the risk for losing it in field if carelessly operated. What Jack suggested is, make the plate rotate, instead of taking-off from the body, so the operation will be much easier, and no way you will leave any parts in field. Thanks Jack, GREAT IMPROVEMENT! will do that! (15/09/09 add) the result is at here.